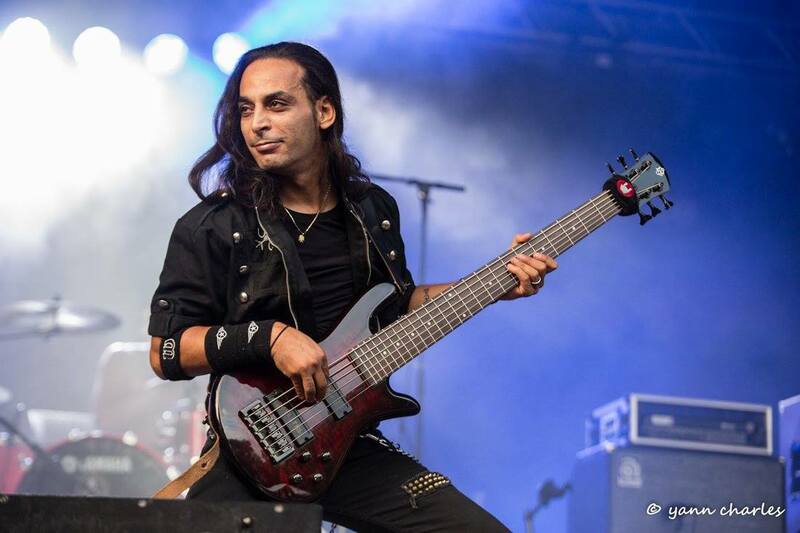 Anis is the bass player for MYRATH (meaning "Legacy") a Metal band from France and Tunisia, a small country well known for its resort areas on the Mediterranean coast but certainly not for its Metal bands, yet in just few years what started out as a teenage cover band, has became a relatively well known and respected band by the international Metal community. Music means everything to me, from the early age my parents discovered the fact that I have an natural inclination to music. I remember when I was just five and my Mum used to listen to the local radio every morning that I enjoyed the beat and rhythm of Michael Jackson , the Bee Gees Pink Floyd and many more … this early introduction exported me beyond the limits of imagination it was Magic ! I was blessed my parents encouraged me to develop my passion in music they purchased my 1st instruments which included my 1st “little” guitar , followed by drums and a then a piano. By eleven years old they had subscribed me to piano lessons there I discovered the what is hidden behind a song, notes and measures. For me it came natural to understand hard complicated musical details , in this world I found myself . I was attracted by low bass notes they sounded right to my ears that is when my love affair with bass guitars began! Unfortunately, when I subscribed in “The Conservatory Zeryeb for Contemporary and Classical Music”, the most reputed conservatory in my country, there was no bass guitar lessons at that time. So, they advised me to take classical guitar lessons to work on the basics, and that’s exactly what I did for 5 years but I was always seeing myself as a bass player, I used to devour every guitar magazine and learn every bass tabs and bass covers ,I was a great fan of Metallica and but who Isn’t ! I used to buy records and try to play the bass like Anesthesia, Master of Puppets, and Justice for All as well as many funk bass players like Victor Wooten , Larry Graham , Jaco Pastorius, Michel Hatzigeorgiou to name just a few of my inspirations. In 1999 I decided to form a band with some friends, and start a real career as a bass player. my dream to become a professional bass player and a famous rock star grew with each passing day. During this time I played Funk & Jazz with my music teacher Elyes Mazzouni (R.I.P), and that gave me a great knowledge to see a the music from a different perspective which helped me later in my career as a Composer and bass player with my heavy progressive metal band Propaganda. We played more than 150 cover songs from Metallica, Megadeath , Satriani , Malmesteen , Pantera , Dream theater .... we composed 2 EPs that merged different styles from the heavy metal to the progressive oriental songs , we performed at numerous concerts in Tunisia but as with many Indie Acts It was very difficult for that band to survive Sadly ! In July 2006, I Joined the Tunisian metal band "MYRATH " meaning “Legacy” I knew how much the metal music costs in my country as well as abroad, but we had our private treasure to move us forward. Our gold was the passion of a talented group of musicians,our Silver was our musical competences and our Diamonds were the people around us who encouraged ,supported and helped ,a priceless fortune was amassed which keeps growing daily from all the love of Metal fans around the globe. My Dreams have become a reality. Myrath is my dream which came true, allowing me the incredible experience of creating and sharing Progressive Oriental Metal with the World, Myrath is making new fans on a daily basis the precious fortune that is Myrath knows no bounds, my experience as a Bass Player, Composer and Professional Musician grow day after day and I know the best is yet to come!